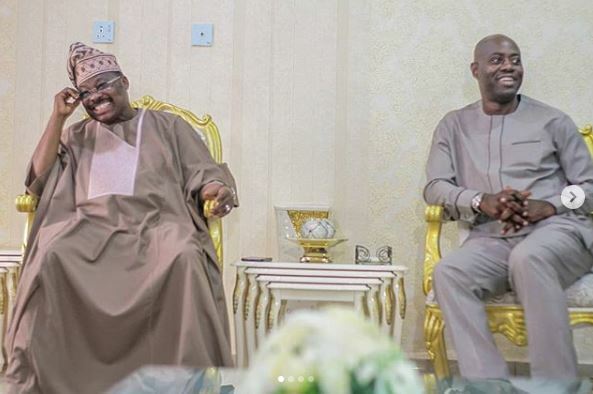 Governor Abiola Ajimobi of Oyo State has advised the Governor-Elect, Mr Seyi Makinde to beware of praise singers as he prepares to take over the administration of the state on May 29. The outgoing governor also enjoined Makinde to avoid acrimony and leverage on relationships by attracting people from both his party and others from across party divide in the state to help him in managing the affairs of the state. He gave the advice on Thursday when playing host to the Governor-Elect who paid him a courtesy call at the Agodi Government House, Agodi, Ibadan, Oyo State. Addressing the visitor in the company of top government functionaries, Governor Ajimobi urged the incoming administration to sustain the peace and security brought to the state by his administration among others feats while also adjusting in the areas his genuine intentions might have been resisted and opposed. He commended Makinde for initiating the visit saying such was a departure from the norm and urged the incoming government to sustain the level of relationship and cordiality. He assured the incoming PDP government of his readiness and availability to ensure the success of the incoming administration in the interest of the people of the state as a whole. Ajimobi said “I congratulate you on the opportunity nature has given you to serve humanity. For me, it is a matter of changing baton and I commend your noble move which is different from the past when after someone lost the election, they will start making troubles and abusing each other. “To me, I am so happy that we are moving this state to a high level. Our own was relatively peaceful and for you to say you want to come and greet me, it is a departure from the past. For me, we must continue on this path. “The peace and security that we have created must be sustained and I know you as a man of peace who is not criminally inclined. I commend you for coming and for me, it is a reflection of your kind of person. “I will advise that in the spirit that you have started, reach out to all and sundry and make it all inclusive to bring in everybody, particularly your party members and others in Oyo state that can add value. “We have done our best in Oyo state especially in terms of security and you must sustain it. In the last eight years, Oyo state has been ranked as one of the most peaceful in the country. “We will be available to you should you need our advice. You should look at the areas we have done well and sustain it and in the areas we have not, please adjust it. We have always been brothers and I believe you deserve it and you have won irrespective of how you did it. The spirit we have started, we must be sustained. Earlier in his remarks, Makinde said the visit was to see the governor first hand since after the conclusion of the elections and also said the incoming administration would be requiring the help of the incumbent in the interest of moving the state forward. Makinde said “The visit is to see you first hand since after the election. We will require your help. Electioneering is over and certain things that we might have said were just for the campaign talks, but now is the time to face reality. Some of the personalities in the entourage of Makinde include, the deputy governor, Mr Rauf Olaniyan, a former Senate Deputy Chief Whip, Senator Hosea Agboola, business mogul, Femi Babalola, PDP state chairman, Mr Kunmi Mustapha, the Campaign Director General, Bayo Lawal and Spokesperson of the Campain team, Prince Dotun Oyelade. Others are, Mr Olayemi Buhari, Mrs Bosede Adedibu, Mr Dare Adeleke, Mr Akin Fagbemi, Mr Tunde Tijani and Chief Jacob Adetoro.